You'll love these old fashioned lemon pie recipes chosen from Grandma's recipe collection. Did you know that lemons are one of the favorite fruits used in making pies? That's because of their tangy, fresh taste. 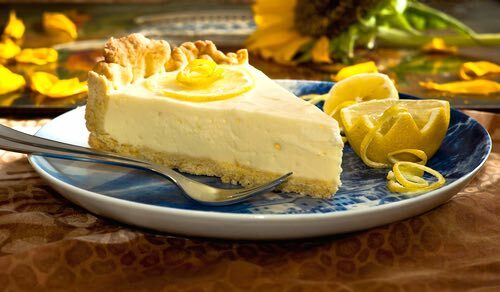 If you want an easy lemon pie recipe, you can't beat these proven recipes. They served Grandma well, and they'll work for you too. Give them a try. 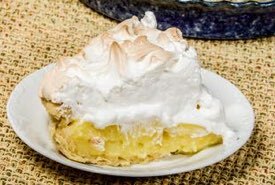 2 egg yolks, 1 cup milk, 1 cup white sugar, 3 tablespoons flour, 1/2 teaspoon salt, 1 tablespoon melted butter, juice of 1 lemon, 1/4 teaspoon grated lemon rind, 2 egg whites, baked pastry shell. Beat egg yolks until light and add milk. Mix together sugar, flour, and salt, and stir into first mixture. Add melted butter, lemon juice, and rind while stirring. Gently fold in stiffly beaten egg whites. Pour mixture into baked pastry shell and bake in moderate oven (350°F) about 40 minutes or until firm. Cover with meringue or whipped cream. 1 level tablespoon gelatin, 1/4 cup cold water, 4 eggs, 1 teaspoonful grated lemon rind, 1 cup sugar, 1/2 cup lemon juice, 1/2 teaspoon salt. Soak gelatin in cold water for about five minutes. Separate egg whites and egg yolks. Add one-half cup of sugar, one-half cup lemon juice, and salt to beaten egg yolks and cook over boiling water until thick. Add softened gelatin to hot egg custard. Add grated lemon rind. Cool. Beat egg whites until stiff and dry. Fold remaining half-cup of sugar into egg whites very carefully. Fold egg whites into cool egg custard. 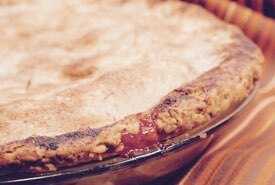 Fill baked pie shell or graham cracker pie crust. Chill in refrigerator. Garnish with whipped cream before serving. Put the softened butter into a bowl, add the boiling water, and stir. Gradually blend in your sifted dry ingredients to form a soft, moist pastry dough. Lightly flour counter and roll out dough until very thin. Line a 10-inch non-greased pie plate with the dough. Combine the flour, sugar, salt, and lemon rind in a bowl. Blend in the butter, then add the lemon juice and slightly beaten egg yolks. Gradually add milk and combine ingredients well. Gently fold in the stiffly beaten egg whites and pour the filling into the prepared pie crust. Bake at 425°F for 10 minutes, then lower temperature to 350°F and bake an additional 20 to 25 minutes until done. Used by pioneer cooks when lemons were unavailable: 3 eggs, 1 cup sugar, 1-1/2 pints buttermilk, 1 teaspoon extract of lemon, 1-1/2 tablespoons flour. Moisten a heaping tablespoonful of cornstarch with a little cold water, then add a cupful of boiling water; stir over the fire till it boils and cook the cornstarch, say two or three minutes; add a teaspoonful of butter and a cupful of sugar; take off the fire, and, when slightly cooled, add an egg well beaten and the juice and grated rind of a fresh lemon. Bake with a crust. This makes a small pie. Two large, fresh lemons, grate off the rind, if not bitter reserve it for the filling of the pie, pare off every bit of the white skin of the lemon (as it toughens while cooking); then cut the lemon into very thin slices with a sharp knife and take out the seeds; two cupfuls of sugar, three tablespoonfuls of water, and two of sifted flour. 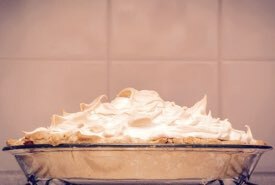 Put into the pie a layer of lemon, then one of sugar, then one of the grated rind, and, lastly, of flour, and so on till the ingredients are used; sprinkle the water over all, and cover with upper crust. Be sure to have the under crust lap over the upper, and pinch it well, as the syrup will cook all out if care is not taken when finishing the edge of crust. This quantity makes one medium-sized pie. Two small lemons, prepared as in the recipe above; sugar, 1 coffee-cupful; 1 egg; butter, 1 rounding tablespoonful; flour, 3 tablespoonfuls; boiling water, 2-1/2 coffee-cupfuls; raisins, 1 coffee-cupful; a little salt. Directions: Stir the flour smooth in a little cold water, and mix all, putting in the beaten egg last, not to scald it. This makes 2 or 3 pies, according to your liberality in filling or size of your plate. Bake with 2 crusts. Raisins, 1 pound; 1 lemon, prepared as above; sugar, 1 cup; flour, 2 tablespoonfuls. Directions: Stew the raisins 1 hour, leaving just water enough to cover them; then, having rubbed the flour smooth in a little cold water, mix all and make 3 pies. 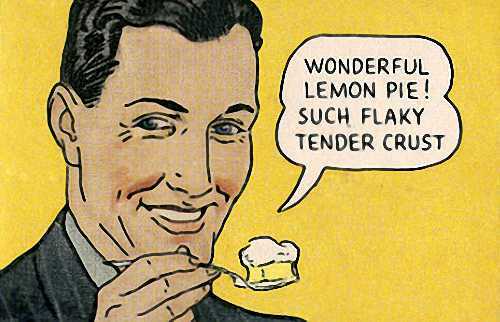 Food historians agree that lemon flavored pies have been enjoyed by dessert lovers since the Medieval Era. They were often served at Elizabethan banquets and Renaissance fairs, and they are still popular today.